This post covers two nearby sites in the lowlands. Gomantong Caves, famed for its bat colonies plus large numbers of nesting echo-locating swiftlets and the lodge at Sukau on the Kinabatanga River where a series of boat trips on the river and its narrow tributaries gave multiple opportunities to see and photograph the wildlife. Whilst at Kinabalu we got caught in as severe rain storm and my bridge camera got wet. Although it could still take photos I couldn’t use the zoom function, or change any of the settings, so it was effectively useless. Fortunately leader Chris Kehoe offered me the use of his camera when we got to Sukau, as he only carried one to obtain photos for the tour report, a commitment he was happy to pass on to me. So thanks to Chris’ generosity I was able to continue to document this excellent trip. After some last minute birding on Mount Kinabalu we crossed a sea of unbroken oil palm plantations on our way to Sukau and the Kinabatanga River. Unlike the parts of the Sunda region, Borneo has very poor soil and is unsuitable for large scale rice production. As a result as recently as the late 40s the island had a small population and was an almost unbroken expanse of virgin rainforest. The development of a strain of oil palm that could grow on poor soils has changed all that and now almost all lowland forest has been converted to plantation. 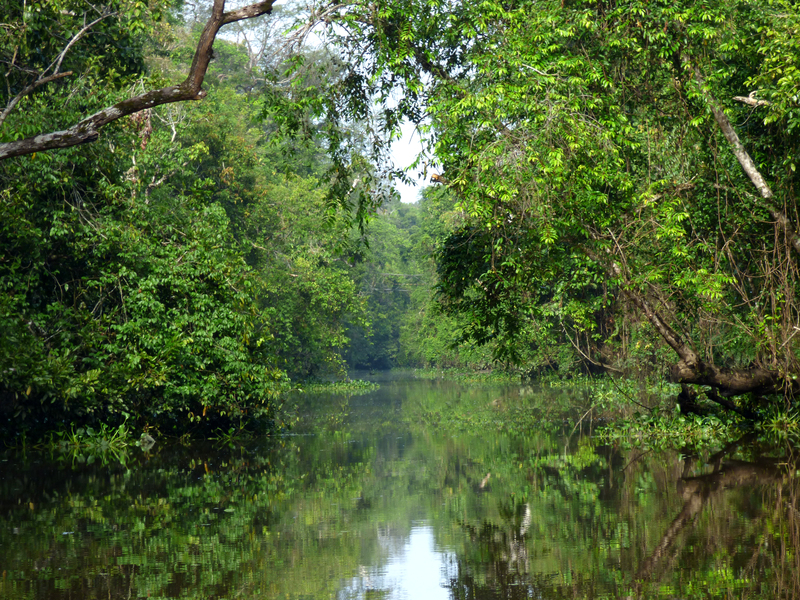 Even along the Kinabatanga River with its wonderful range of wildlife, oil palm crowds in and even the narrow strip of riverine forest is broken in parts by plantations. Before we got to the river we stopped at the famous Gomantong Caves. 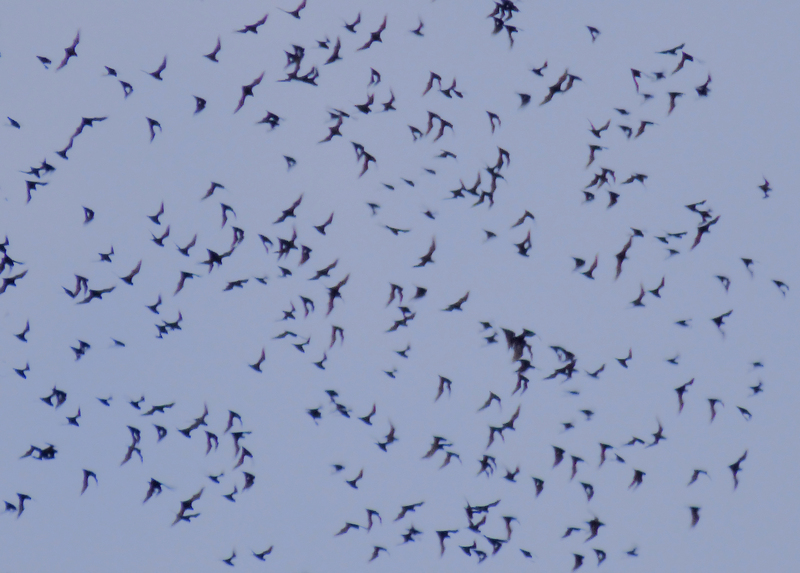 Featured on BBC wildlife programs, this is the place to see all three species of echo-locating swiftlets on the nest, which is the only safe way to tell them apart, as each species nest is highly distinctive. 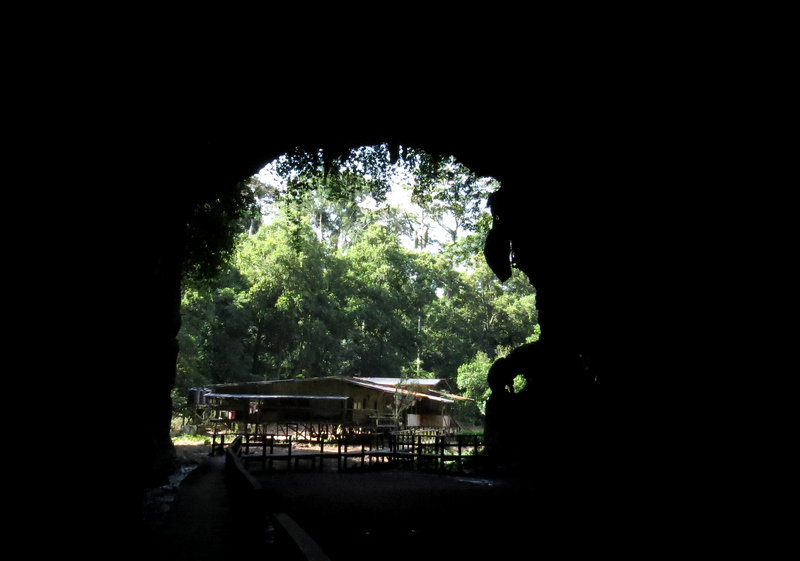 The entrance to Gomantong Caves. There is a boardwalk around the main chamber but it is covered with bat and swiftlet droppings. The entire floor of the chamber consists of a huge pile of bat poo several metres high, as a result the entire place, including the boardwalk and hand rail is covered in cockroaches. 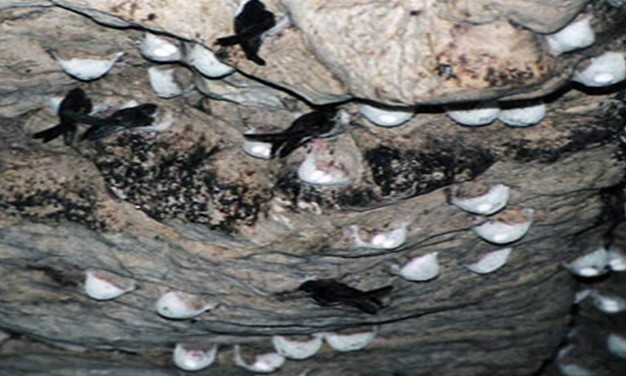 Harvesting swiftlet nests for birds nest soup is highly lucrative. As the commercial value of the caves is so high the owners guard against poachers. The smell of ammonia from the huge mound of bat poo behind the guards shelter is overwhelming, so this cannot be a pleasant place to make a living. At long last, a breath of fresh air. 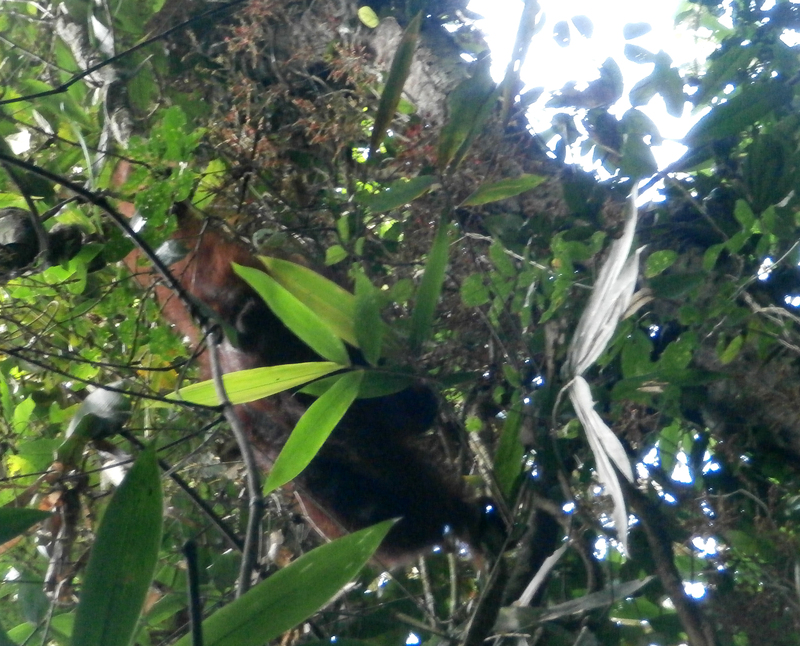 As we left the caves we came across a mother and baby Orang Utan, part of a small group marooned in this island of forest in a sea of oil palm . I only had my pocket camera so this highly magnified shot is the best I could do. I think it was my obvious disappointment of not being able to properly photograph this amazing animal that led Chris to lend me this camera. At dusk many thousands of Wrinkle-lipped Bats emerge but from our viewpoint we could only see a few. 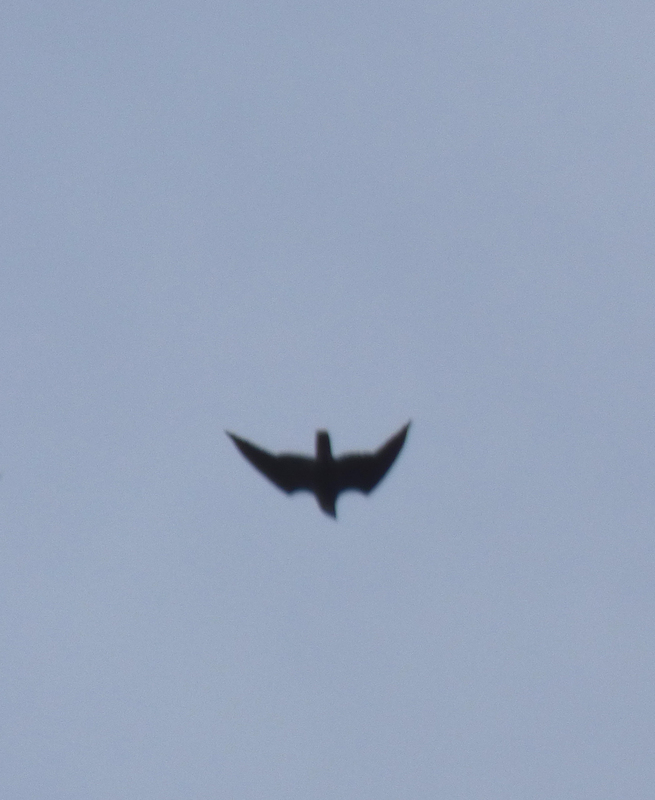 … and we saw the shadowy shapes of a Bat Hawk chasing it’s supper. 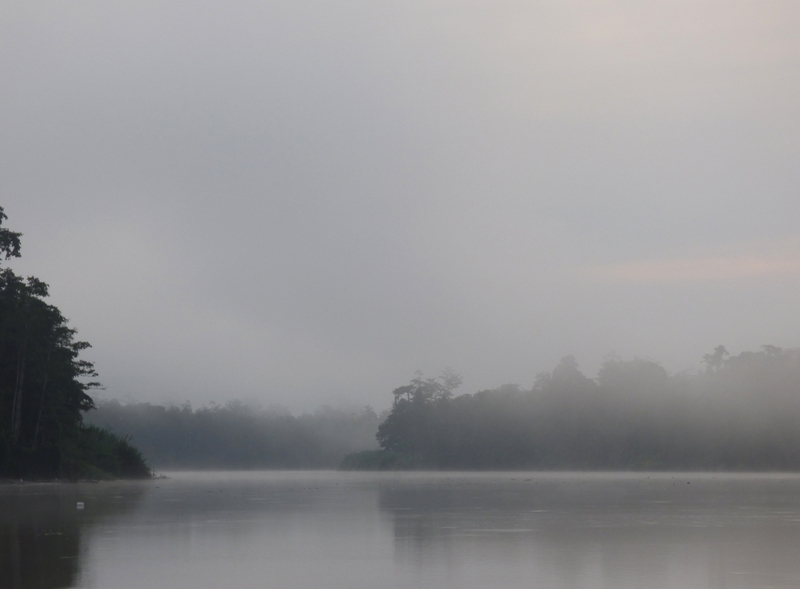 … but soon the mist cleared and by the time we had entered the quiet backwaters the sun was up. 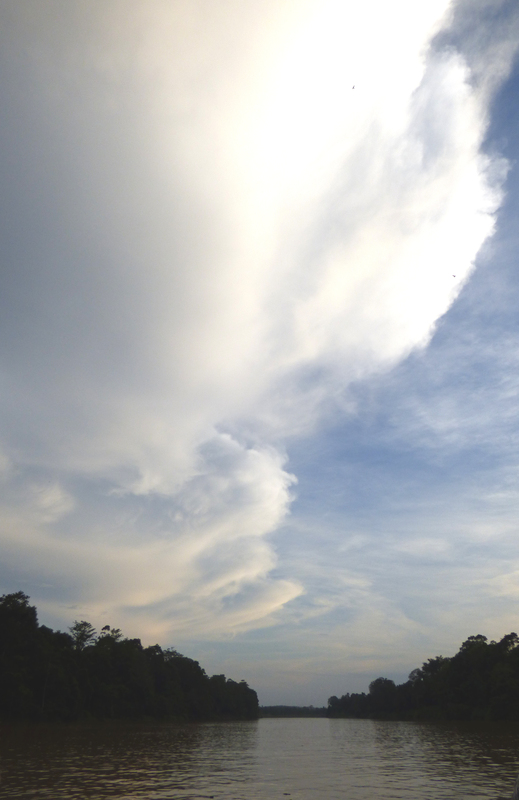 Our main target in these side channels was the mega-elusive Bornean Ground Cuckoo, which we heard but did not see. … but I did get this shot of a mature male with his enormous nose and white underpants. 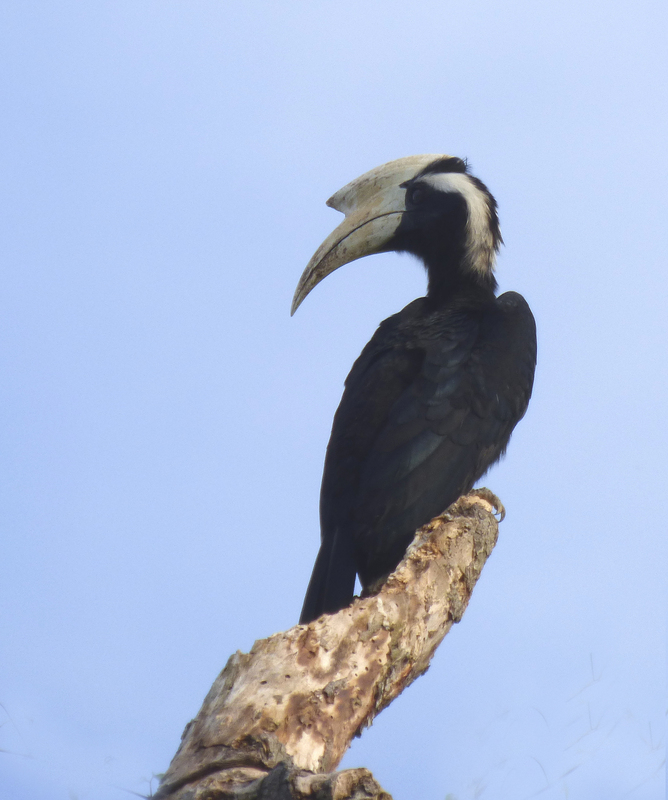 The area was a mecca for hornbills with five species being seen. 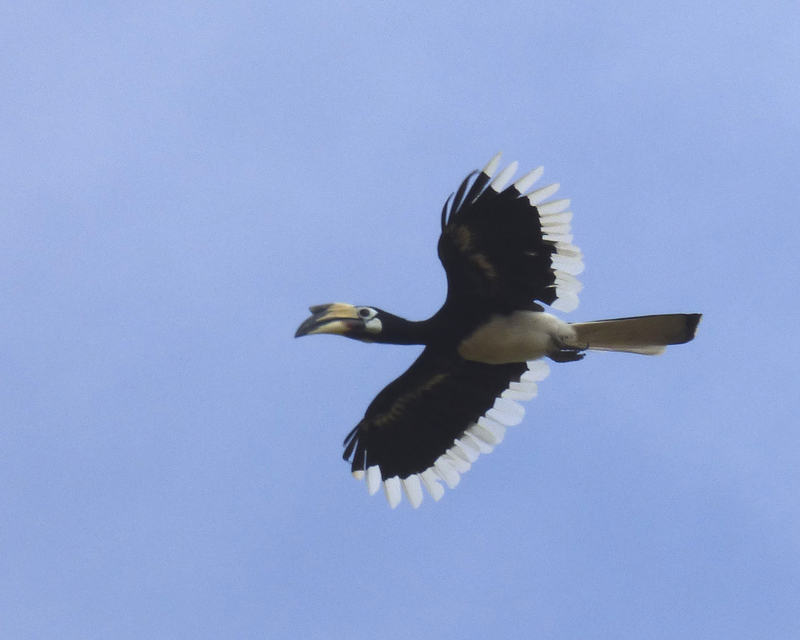 This is a Wrinkled Hornbill. Asian Black Hornbill. The white stripe on the head is only seen in a minority of male birds. There were plenty of raptors along the river such as this Grey-headed Fish Eagle. 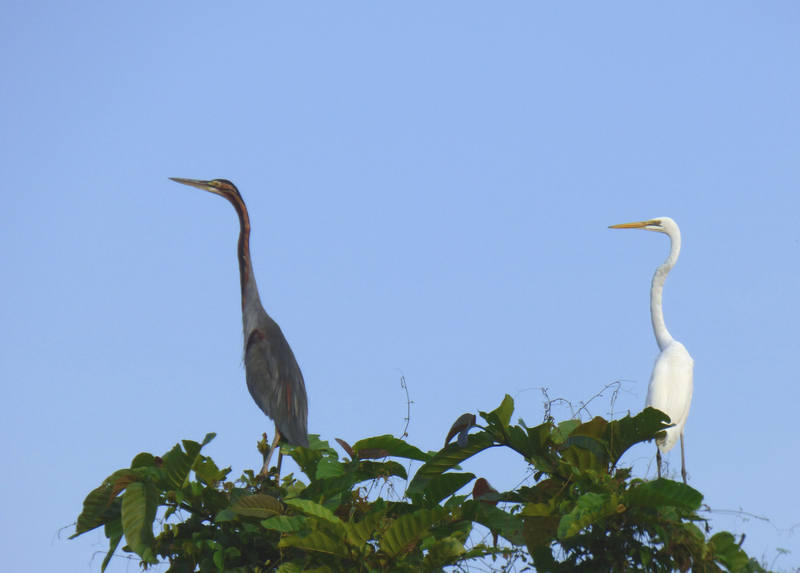 Purple Heron and the resident modesta race of Great Egret. Considerably smaller than the migrant race from mainland Asia (no bigger than the Purple Heron), this form has been considered a separate species. I was particularly pleased to get such good views of Storm’s Stork. This species has declined greatly and the riverine forests of Borneo are it’s last stronghold. It was the last of the world’s 17 species of stork for my list. 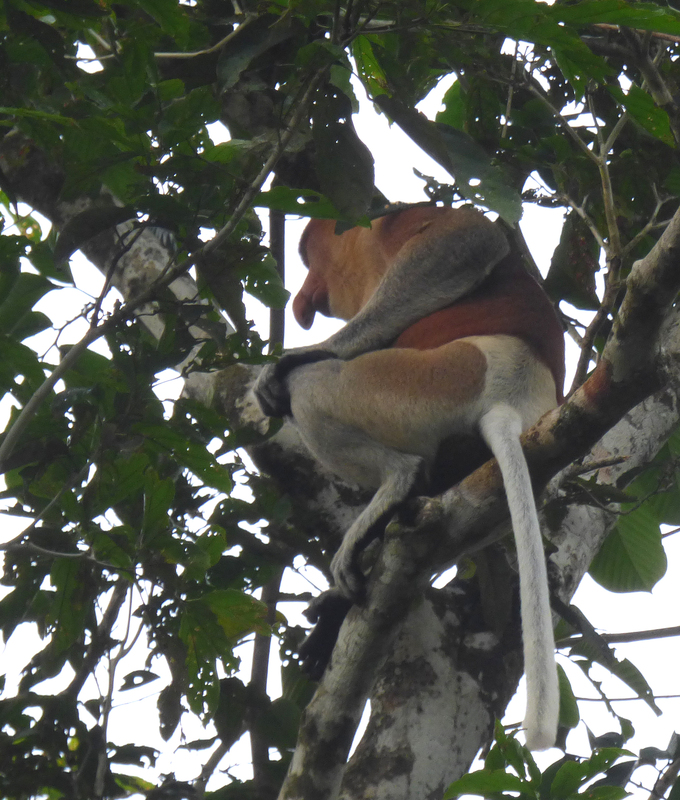 Long-tailed Macaques were common …. as were Monitor Lizards …. 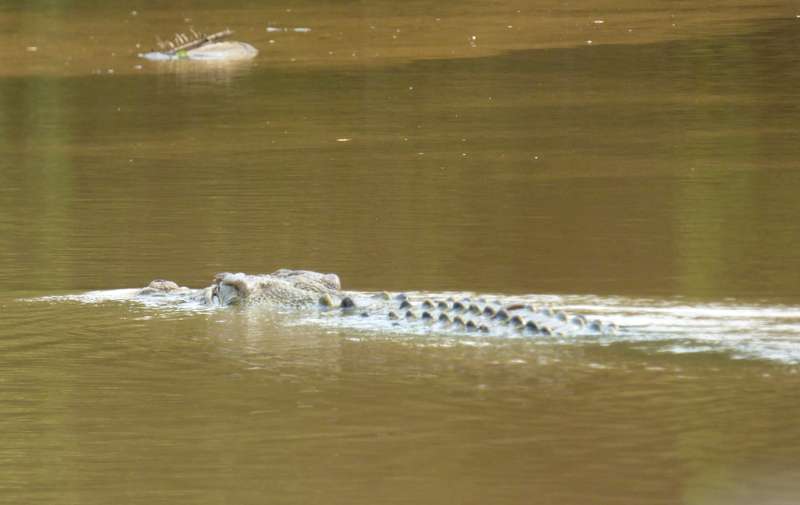 … and even the occasional Estuarine Crocodile was seen. 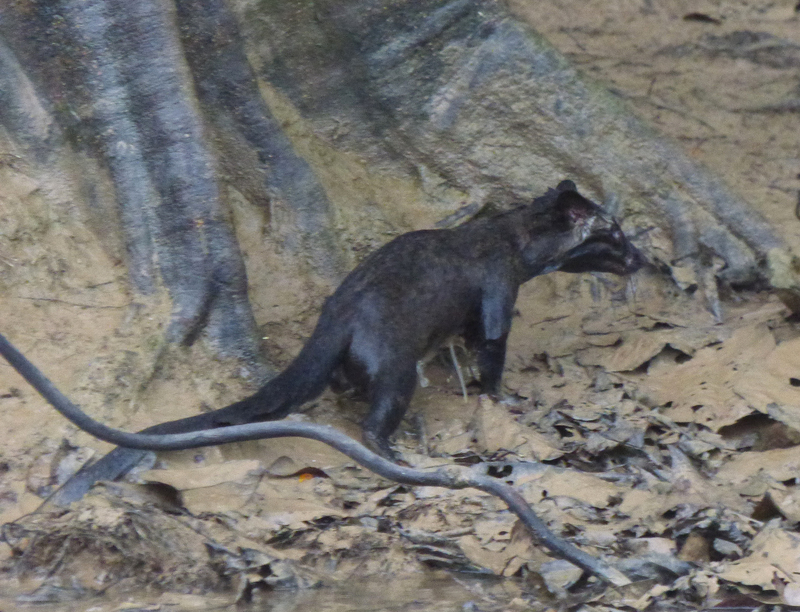 This Masked Palm Civet swam across the river in front of our boat …. and emerged rather bedraggled on the far bank. 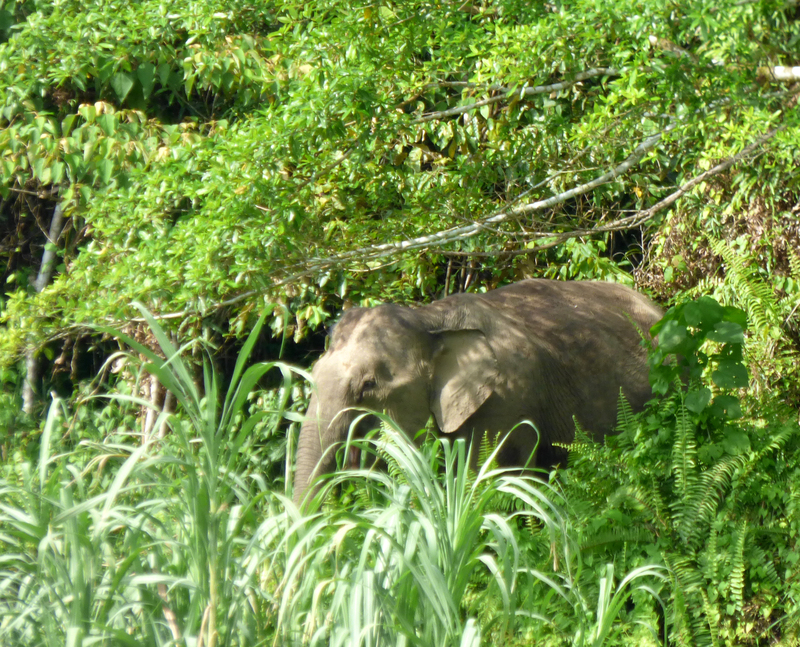 Along the bank of the main river we saw several Bornean Pygmy Elephants. They differ considerably in size from Asian Elephants of the mainland and maybe should be treated as a different species. 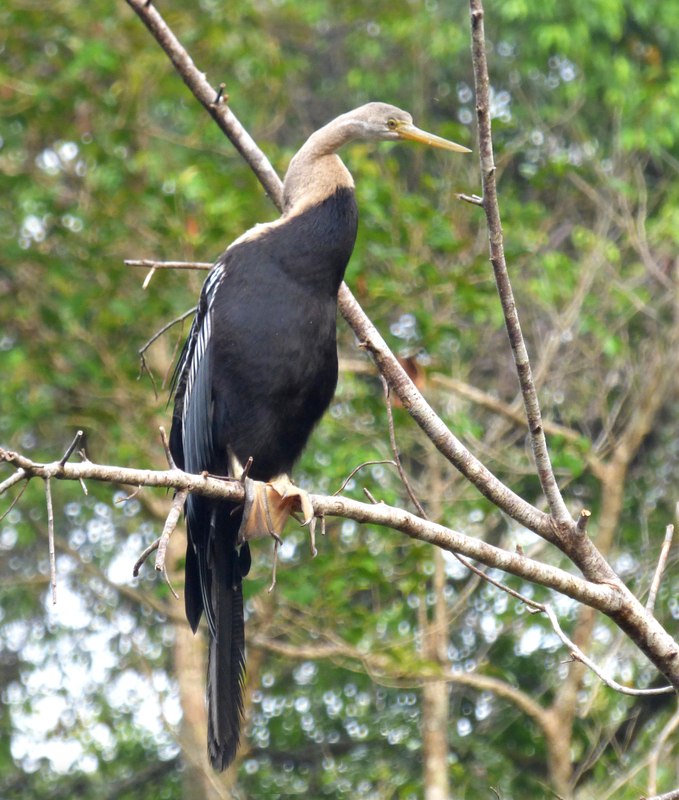 But by far the best observation along the river was a flock of Bornean Bristleheads which qualified as my ‘bird of the trip’. As I mentioned in an earlier post, Bristleheads are a monotypic Family and are indeed the last family I needed to see. 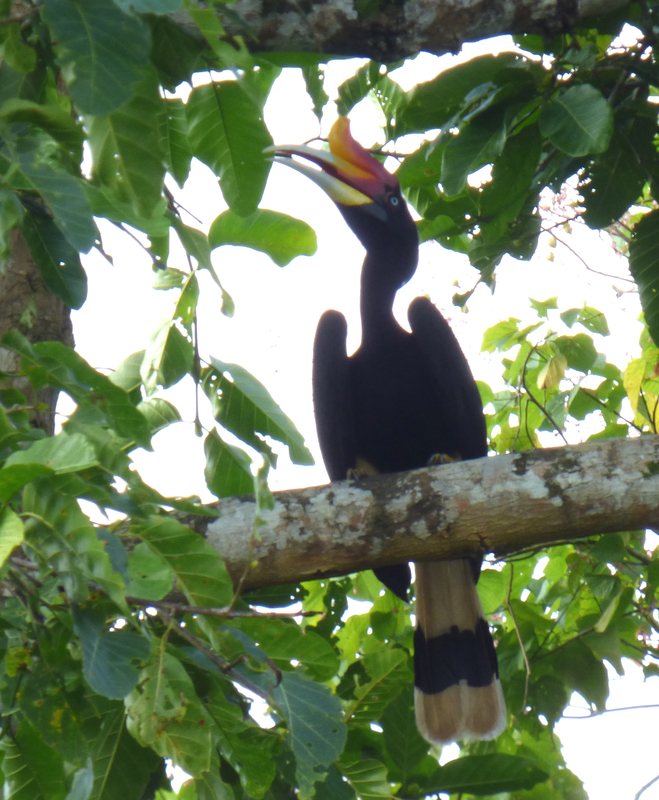 We did see some later at Danum Valley but not so well and this fortuitous encounter along the river saved us lots of time at Danum which was put to good use. As an aside, contra to my earlier post on the bird Families, the new checklist by Lynx/BLI did NOT treat the New Zealand Kakapo as a monotypic family and their cover illustration has been changed accordingly. So after two and half days we said goodbye to Sukau, the Kinabatenga River and its glorious vistas and headed off for rainforest lodges to the south.